Telč, called “Venice of Moravia”, is a real pearl of the Vysočina region. Initially a medieval royal water fortress, it was founded at the crossroads of busy trade routes in the 13th century. Some remnants of late Gothic city walls with gates can be seen there. The main sights of the town are the imposing Renaissance chateau with an English-style park and mainly the Zachariáš of Hradec Square, its unique intact complex of historical houses with arcades and baroque and classicist gables. The Town Hall has preserved its unique façade in the genuine form dating back to the year 1574. Instead of a Gothic castle there is now a chateau from the 16th century with an adjacent Renaissance garden on one side and a large English-style park with a classicist conservatory on the other one. The whole historical core is surrounded by two vast fishponds – Štěpnický a Ulický. In the past, linked by the moat called Parkán, they made parts of town defences. 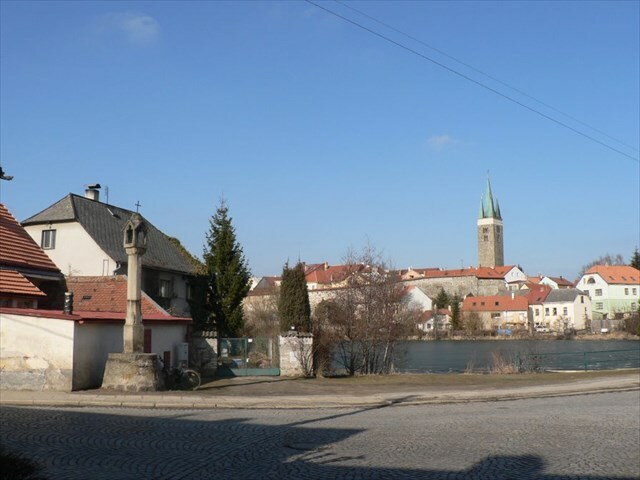 The suburb Staré město (Old Town) is also remarkable for its urban development and sights. Its historical core (around the Church of the Mother of God) was proclaimed an Urban Conservation Zone in 1995. The Old Town is separated from the Urban Conservation Area Telč (MPR Telč) by the pond Staroměstský. The greater part of banks of all ponds is open to the public and enables visitors to admire beautiful views of the town. The series Telč – MPR consists of 3 caches named after the town fishponds: Staroměstský, Štěpnický and Ulický ponds. The routes lead along their banks. In every cache you will get one of Bonus digits (P, Q, R) necessary to hunt a Bonus Cache. The Bonus Cache Telč – MPR – Parkán is in the surroundings of the moat – Parkán. Počáteční stanoviště je na náměstí Zachariáše z Hradce. Ulicí U masných krámů projdeme přes Belpskou lávku a dále vlevo okolo zimního stadionu projdeme k Hradecké ulici. Zde zabočíme vlevo a dojdeme až na křižovatku, kde pokračuje ulice Na Hrázi, která tvoří hráz Ulického rybníka. Trasa kešky zahrnuje 3 stanoviště (stage) tak, aby byla snadno identifikovatelná z fotografií. GPS souřadnice stanovišť jsou zadána pouze pro upřesnění. Kdo má dobrou vizuální paměť se obejde bez navigace. Na jednotlivých stanovištích zjistíte čísla A, B, C, pomocí kterých určíte souřadnice finálky. Ve finálce je uložena hodnota bonusového čísla R potřebného pro odlovení bonusové keše Telč - MPR Parkán. Starting Point is in Zachariáš of Hradec Square. Walk down U masných krámů Street and cross the Belp footbridge, then turn left and go past the ice rink to Hradecká Street. There turn left and go down the street to the crossroads with Na Hrázi Street (on the dam of the pond Ulický). The route of the cache includes 3 Stages which can be easily identified by the pictures. The GPS coordinates are stated only to be more specific. People with a good visual memory can manage without a GPSr. At every single stage you find out the digits: A, B, C. Using them you get the coordinates of the Final Stage. There you find the bonus digit P necessary to hunt the Bonus Cache Telč – MPR – Parkán. Písmenu A přiřaďte toto pořadové číslo měsíce uvedeného na pamětní desce, u které stojíte. Nacházíte se u božích muk. Na boční straně této památky je uvedený letopočet. Písmenu B přiřaďte součet cifer tohoto čísla. Na podstavci sochy před vámi jsou zřetelná pouze dvě písmena. Písmenu C přiřaďte počet písmen anglické abecedy, které se nacházejí mezi těmito dvěma písmeny. You can read properly only two out of letters carved on the pedestal of the statue. C = number of English alphabet letters entering between those two carved letters. Přeji úspěšný lov, nezapomeňte si poznamenat hodnotu bonusového písmena R, kterou naleznete ve finálce kešky. Have a successful hunt. Remember to note down the Bonus letter R which you find in the Final Stage of this cache.